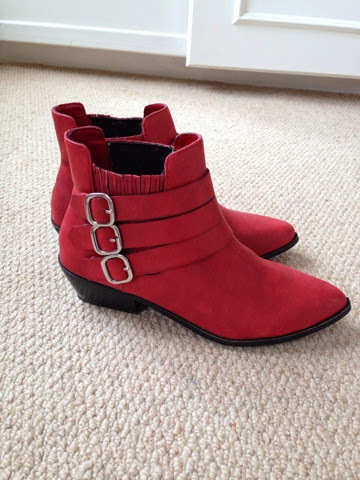 Thanks to ASOS speedy service the Pull & Bear red boots I ordered last week arrived on Friday! A pretty good replica of the ones Sienna is sporting here!! 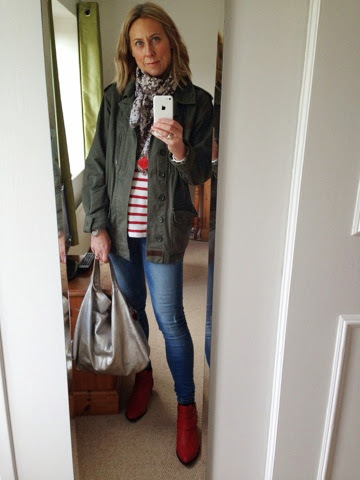 My version of Sienna's outfit....I've put my own spin on this by wearing it with a French Connection Breton, camouflage scarf and metallic Furla bag!! The boots are keepers!! Not something I would ever have imagined buying but I really love them!! They arrived just in time for the weather turning.....looks like we are set for the April showers until the end of the month and beyond! These are perfect Spring/Summer boot for those rainy days!! If you are thinking of ordering I would recommend sizing up as they are very narrow! I am a size 6 but they were out of stock so I tried a 7.....I wouldn't have got my feet in the 6 and as they are not leather they won't give!! 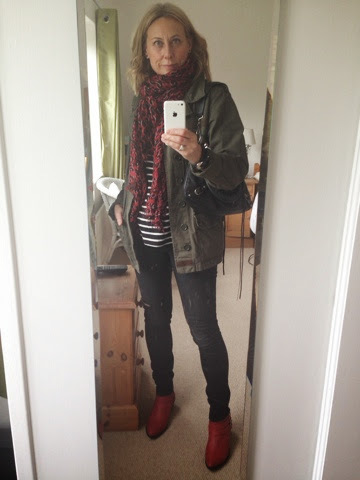 Here I am wearing them for second day in a row with Topshop parka, Zara stripe Top, H&M skinny ripped jeans, leopard print scarf (via eBay) and Balenciaga bag. 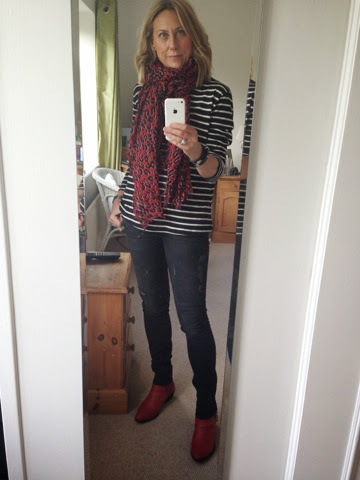 I've been experimenting with a couple of other looks and tried the boots here with a 7 for All Mankind biker jacket (courtesy of T K Maxx last year) H&M kidswear breton (Autumn 2013), Zara jeggings (last year) and scarf from a street stall in Bath (old). Here I've teamed it with Zara coat (last year) ASOS charcoal cami (current), Topshop Jamie jeans (Autumn 2013) and scarf from a stall in Bath again. Lastly......I did participate in another Sienna style purchase from H&M! I went for this style of cardigan as opposed to the bolero I featured in my last post. I went for in the black version of the below....sadly I couldn't find it online to use the 30% off discount offer so I had to pay full price £29.99 :0( Not that I mind though as it is fab!! I am off to the Fashion Bloodhound pre-loved designer sale event in Bath tomorrow night so this outfit will get it's first airing! I shall report back if there any purchases made!! So....do you think I have been successful at recreating Sienna's style? 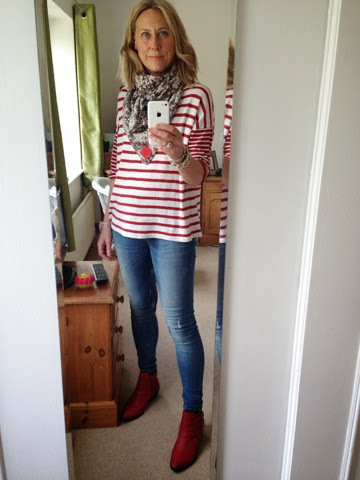 I have to admit that I thought that the husband and my mum would laugh me out of the room when they saw bright red boots but they have both said they love them which is a good sign!! All in all a couple of good purchases I feel!! Whose style have you been stealing lately?! I love receiving and responding to your comments.....I look forward to hearing from you!! I will be back soon with an update of the pre-loved designer sale! Hope I get lucky!! I think I maybe stealing your style. The boots are ace and look great on you. Enjoy your evening. They were indeed made for strutting! Lol! Thank you so much Maxine!! Oh my! I absolutely love them! A real statement and love how you've styled them - especially the first pic with the red stripes. 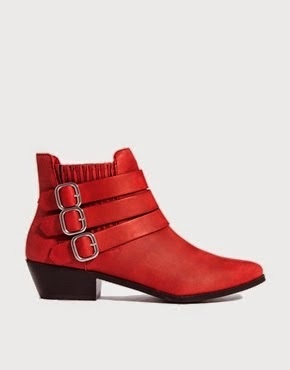 It has reminded me of some Russell and Bromley boots I have from about 15 years ago (red snakeskin) - still have them somewhere! Yes have to agree that those boots look pretty damn fine to me. Also can I just say on the subject of stealing style. I have ordered the mango jumpsuit you featured a couple of posts back. I hope the quality won't disappoint. As the price is so very reasonable even without a discount code. Fingers crossed. The boots look fab....love all the outfits here Michelle:) Have a great weekend! Diary of an April shopaholic! Next bomber jacket - 6 ways - 6 bloggers!